'Massive' Campaign Launched To Retake Raqqa, ISIS' So-Called Capital : The Two-Way Syrian rebel forces begin a military offensive targeting "the obscurantists [who] have taken this city as capital for their so-called state." 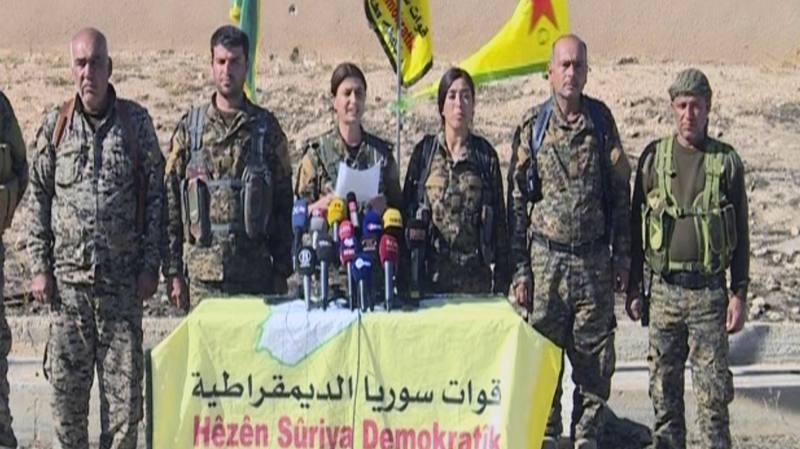 Commanders of the U.S.-backed Syria Democratic Forces announce a campaign targeting "obscurantists" — ISIS — that have claimed Raqqa as their capital. This image comes from a frame grab from the Arab 24 network. Targeting "the obscurantists [who] have taken this city as capital for their so-called state," Syrian rebel forces have launched a military offensive aimed at kicking ISIS out of Raqqa. The groups waging the campaign, Operation Wrath Of Euphrates, is U.S.-backed and Kurdish-led. Senior members of the rebel force proclaimed the start of the campaign this weekend in Ain Issa, a town about 35 miles north of Raqqa — halfway between the larger city and the Turkish border. "There was no immediate comment from the U.S. military. Washington sees the Syrian Kurds as an effective partner in the fight against ISIS. Turkey, another ally in the coalition, disagrees sharply, calling them terrorists aligned with Turkey's outlawed Kurdish militants. Turkey has lobbied to be part of the operation in place of the Kurdish fighters. "The Kurdish-led rebels say the operation, including Arab and Syrian Turkmen fighters, will start in the countryside outside Raqqa and move toward the city." The push toward Raqqa comes days after Iraqi forces entered Mosul, an ISIS stronghold in Iraq that's around 280 miles to the east of the Syrian city. As the long-awaited offensive in Mosul was showing signs of success last week, ISIS leader Abu Bakr al-Baghdadi purportedly released an audio message calling on his fighters to hold fast in Mosul, and to conduct attacks in Turkey and Saudi Arabia. As of Friday, the U.S.-backed attempt to retake Mosul had progressed more quickly than had been expected — but U.S. Major General Gary Volesky, who's leading U.S. forces in Iraq, tells NPR that he believes fighting will become more intense as Iraqi forces close in on the city's center — an area where ISIS fighters have reportedly gathered civilians to use as human shields.